Goodwin College had plenty of help from the community-at-large in helping create a warmer and more wholesome holiday for many families and people in need. Members of the Community Engagement Committee worked to get the word out about the Turkey Drive. The week before Thanksgiving, the College joined with WTIC 96.5 FM and other partners within the greater Hartford area for a successful clothing and mitten drive. Over three days, Goodwin collected frozen turkeys and cash donations to benefit Foodshare, a nonprofit organization dedicated to feeding the hungry. Additionally, the College collected donations of new winter clothing, such as hats, scarves, gloves, and mittens, to go to the Hartford-based Love Kitchen Ministry. In turn, the organization would distribute the clothing to people who might otherwise go cold during the winter months. CBS Connecticut, which operates several radio stations throughout the state, helped coordinate the effort. On Tuesday, November 19, radio personality Damon Scott was among those who came to Goodwin to encourage a successful drive. 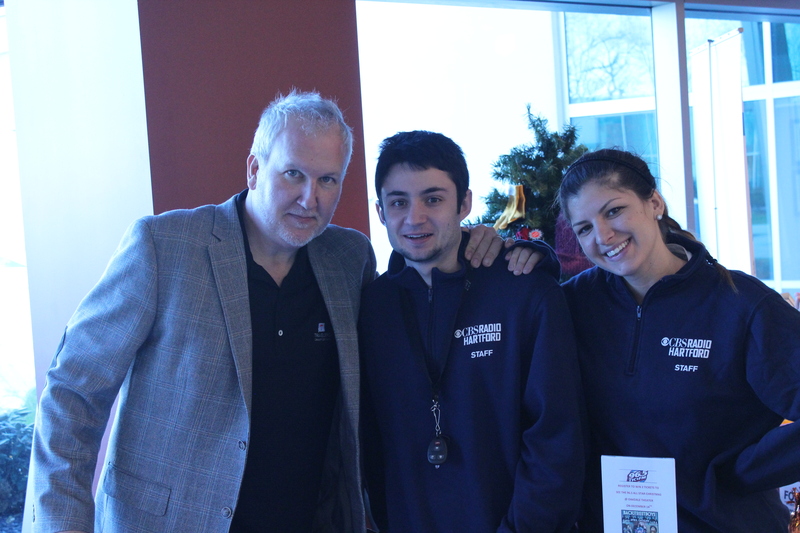 Radio personality Damon Scott was joined by members of the CBS Radio Team. 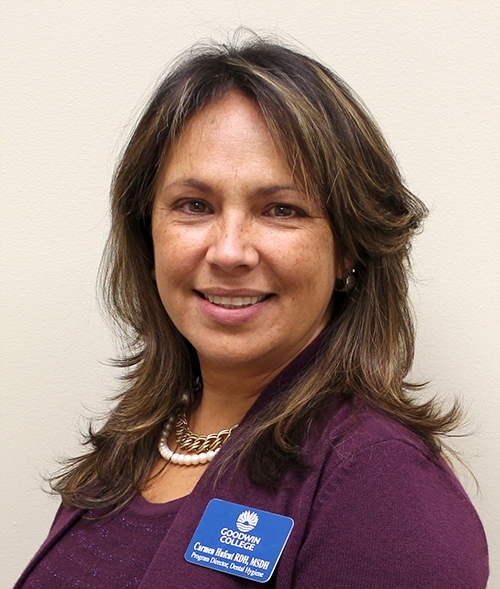 “We had great participation from people on campus and beyond and the feedback from the community has been very positive,” said Kimberly Nadeau, the Admissions Manager at Goodwin College and chair of the institution’s Community Engagement Committee. Donations were steady over the three days. East Hartford businesses and organizations such as Marco Polo Restaurant, Augie & Ray’s, and the local Chamber of Commerce contributed frozen turkeys to the effort. Goodwin students and employees donated food, money, and clothing, and many people from outside the College stopped in to help. Holiday trees became covered in warm clothing, and bags of more woolen items overflowed. Much of the clothing was courtesy of a determined 12-year-old girl. Haley Phelps, a 6th grader at Haddam-Killingworth Middle School, recently had friends bring clothing donations in lieu of gifts at her 12th birthday party. Working with her parents, Haley donated the clothing to the Goodwin drive. “The happy feeling I have knowing we will help keep others warm this winter was better than any present anyone could ever give me,” Haley wrote in a letter to Goodwin. 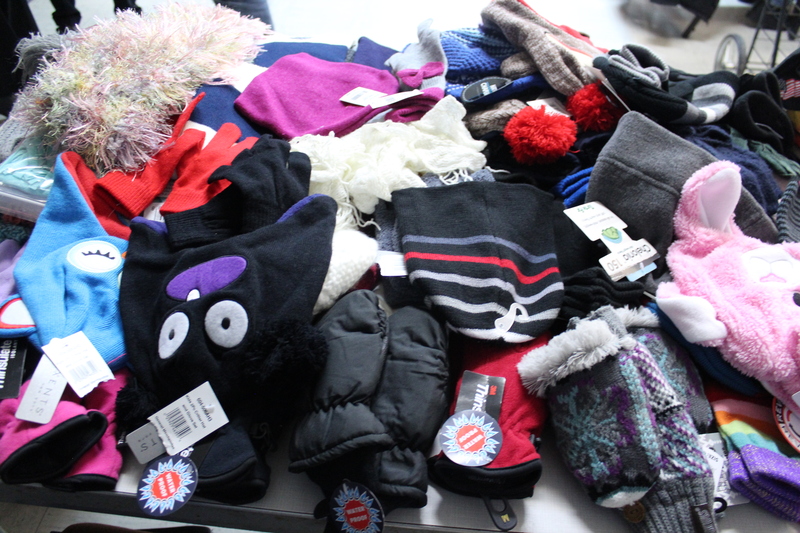 Cold winter nights will be a little warmer thanks to those who donated hats, gloves, scarves, and mittens. By the time the drive concluded, both the freezer and the coffers for Foodshare had been filled. 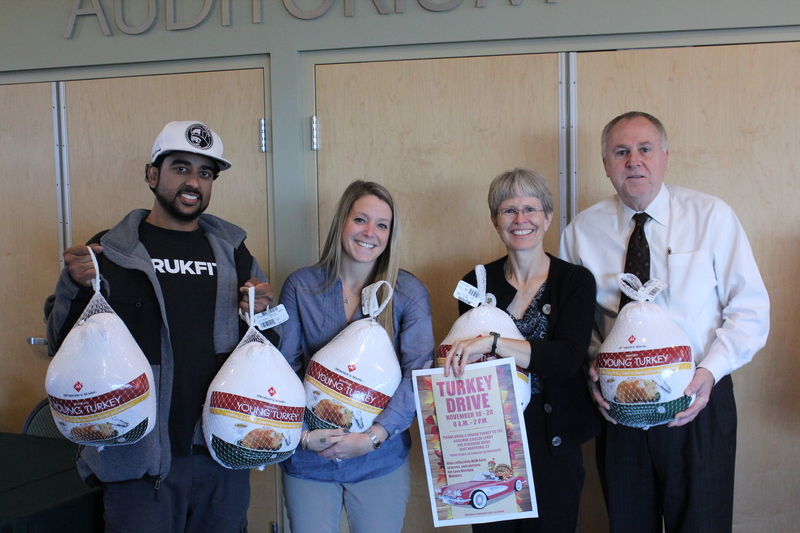 In total, the College collected 33 frozen turkeys and about $1,200 in cash, which Foodshare representatives collected for the benefit of the hungry. 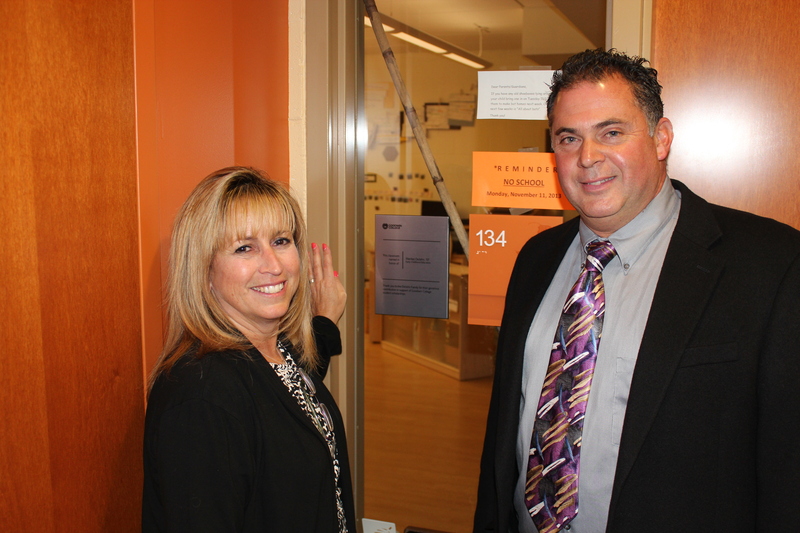 On Thursday evening, Nadeau and fellow Community Engagement Committee members Sandy Pearce and Lee Hameroff went to Love Kitchen Ministry to drop off the clothing. Pearce said the Ministry was very appreciative of the effort and the College looks forward to partnering again with the organization in the future. Goodwin College’s continual efforts to provide career-focused educational opportunities to “the undiscovered student” have been recognized with the Business Excellence Award from the Urban League of Greater Hartford. On Friday, November 1, the Urban League held “A Night at the Bellagio” at the Hartford Marriot, a casino-themed evening to celebrate people and institutions that align with the organization’s goals to provide equal opportunities to all. Goodwin President Mark Scheinberg, as well as the College as a whole, was one of a handful of honorees for the evening. Scheinberg could not attend as the result of a Young Presidents Organization gathering in Mumbai, India. In his place, a contingent of Goodwin ambassadors attended the upscale event. Todd Andrews, Goodwin College Vice President of Economic and Strategic Development, accepted the award on behalf of Scheinberg and the College. Congressman John B. Larson, a good friend to Goodwin and a native of East Hartford, presented the award. Larson represents Connecticut’s 1st Congressional District, which includes Hartford and East Hartford. 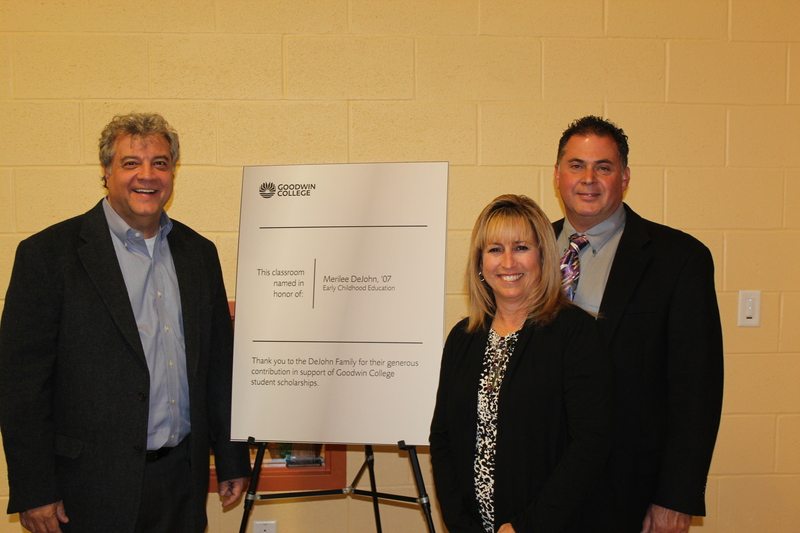 “I am honored to have such an outstanding institution in my district, and I know that Goodwin College and President Scheinberg’s vision will continue to propel our students towards meaningful and rewarding careers for years to come,” Larson said. The honor is the latest of several bestowed on President Scheinberg. His accolades include the 2012 East Hartford Chamber of Commerce Chairman’s Award, the Hartford Business Journal 2011 Lifetime Achievement Award, and the 2011 Paul Harris Award from the East Hartford Rotary Club. What if the Nazis had won World War II? What if the South had won the Civil War? What if chimpanzees had evolved into super-intelligent beings and kept human beings in zoos? Welcome to the bizarre world of alternate history, where “what if” becomes “what was.” It is a world in which Brian Dixon, Assistant Professor of English at Goodwin College, and his writing partner, Adam Chamberlain, are well traveled. Columbia and Britannia, edited by Goodwin English Professor Brian A. Dixon and his writing partner Adam Chamberlain, is available on Amazon.com. In their 2009 collection of short stories, Columbia and Britannia, they weave a historical narrative that postulates a world in which the American Revolutionary War never took place. That’s right, no Fourth of July cookouts, no “We hold these truths to be self-evident,” no Stars and Stripes, no Lady Liberty: a world in which North America is just another colonial outpost in the British Empire. 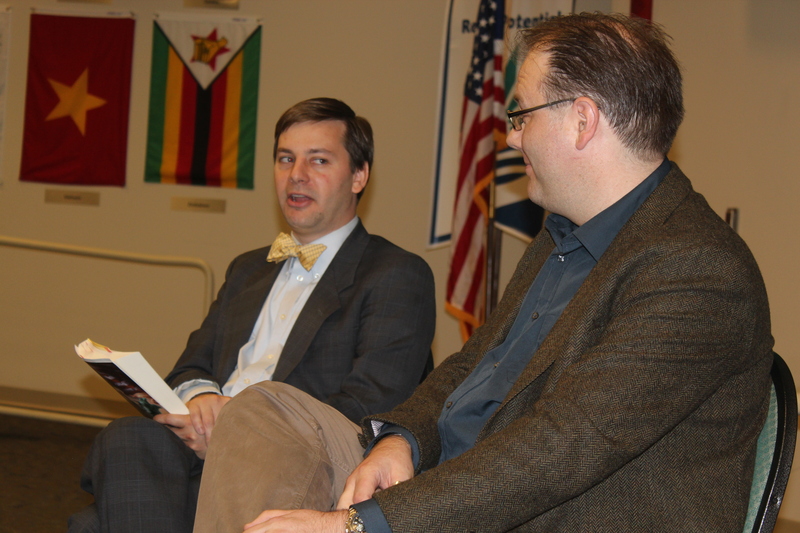 On September 23 in the Goodwin College auditorium, Dixon and Chamberlain discussed their book with a receptive crowd. The audience listened with rapt attention as the authors explained their ideas about alternate history. Travis Samuels, one of the students attending the event, found it interesting how Dixon and Chamberlain altered history by diverging from historical events and creating a different time line. Dixon, an American obsessed with British culture, has taught college English for over 10 years, since he received his Ph.D. from the University of Rhode Island. Through social networks such as Skype and Facebook, he came into contact with Adam Chamberlain, an Englishman who enjoys country music, and who now resides in London. Chamberlain has earned his degrees in psychology and criminology. Their unique friendship was the starting-point for the imaginative journey that grew into Columbia and Britannia. Their vision of alternate history is one in which familiar events combine with bizarre twists. For example, in Columbia and Britannia, the first astronaut landed on the moon in 1996. Fenway Cricket Grounds became the target of a terrorist attack in 2001. A man named John Kennedy assassinated Queen Elizabeth II in 1962. These points in their story exemplify the manner in which Columbia and Britannia blends familiar historical benchmarks with surprising divergences and ironies that rewrite history in unforeseen and startling ways. As the book signing concluded, there was an opportunity for a question and answer session with Dixon and Chamberlain. Both men were asked where they get their inspiration to write. Even as accomplished writers, they both agreed that they draw their inspiration from peer review and collaboration. 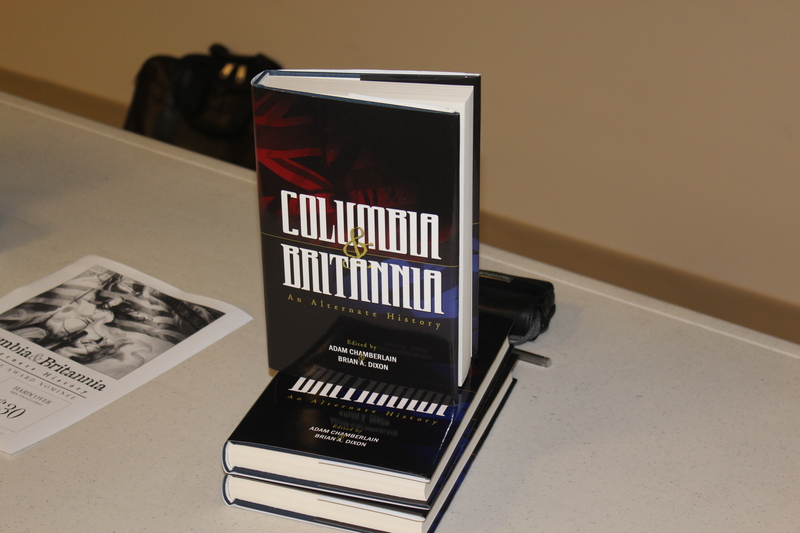 The process of collecting the stories in Columbia and Britannia required the author-editors to work closely with a team of writers who selected what kind of story they wanted to tell and cooperated with Dixon and Chamberlain to make sure that all of the details in all of the stories corresponded. The manner in which Dixon and Chamberlain worked with one another and with their contributing authors to tell their story illustrates the value of teamwork in developing a writing project. The audience came away with a valuable lesson in how important collaboration is to the writing process.